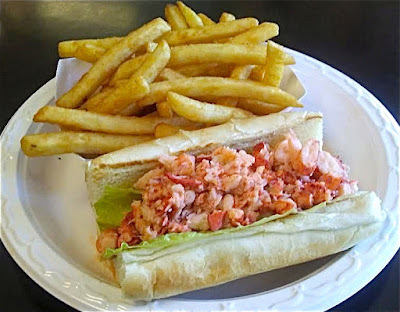 In PTown, The Coffee Pot's hot lobster roll is a delicious lunch time bargain. This big, hot lobster roll at The Coffee Pot really hits the spot as PTown weather begins cooling off with the changing season. I added an order of their terrific French fries, too. Fresh from the fryer and still sizzling, these are some of the best in town. It's lined with a leaf of fresh iceberg lettuce, then stuffed with 6 ounces of succulent, warm lobster meat doused with melted butter. This great sandwich is so simple, but sooo good! It has about 50% more lobster than most others in town, and the textures of the bun and filling are great together. Add a little crunch from an order of fries and this satisfying lunch or supper has got you covered, all for a price that's less than most others as well. You just can't beat it. Find the Coffee Pot at Lopes Square, in the heart of Provincetown, where Standish Street crosses Commercial and heads down toward the pier. Eat-in or takeout, or carry your meal out to their patio seating for a little people watching while you eat. You might get one of their fresh baked goodies for dessert, too.